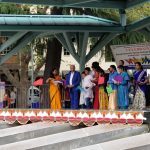 The organization, Hindus of Greater Houston, hosts an Annual Janmashtami Celebrations in Houston each year and this was the 20th anniversary of the gala. 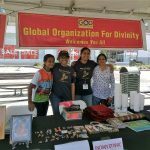 Global Organization for Divinity (G.O.D) USA, with blessings and guidance from Sri Muralidhara Swamiji, had the opportunity to host a booth during this popular event. 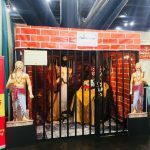 Additionally, G.O.D’s Gopa Kuteeram youngsters were also responsible for the Welcome booth of the event, which was held at the George R. Brown Convention Center, in Downtown Houston. This year the organizers had invited reputed singer Anup Jalota to perform a concert. The chief guest was Hinduism Today’s publisher Satguru Bodhinatha Velayanswami. Many Hindu Temples and other religious/social organizations in the Greater Houston Area represented themselves in the booths (~30 in total). An estimated crowd of about 5000 people attended the function which ended with an all-night Raas Garba. It would be an understatement to say that the G.O.D booth was the liveliest of all. GOD Satsang members arrived at the convention center 4 hours prior, and did elaborate decorations. The GOD booth attracted all because of its beautiful presentation of Bhagavan Sri Krishna, the constant chanting of the Mahamantra, and the games and prizes. 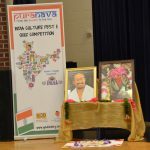 Similar to last year, a raffle contest was organized, where people chanted the Mahamantra to qualify themselves to enter a raffle drawing for winning prizes that were drawn each hour. Each winner received Sri Swamiji’s books in English, a Mahamantra CD, a Mahamantra sticker, copies of recent Namadwaar US newsletters, and brochures about G.O.D. Prominent people from the community were invited to pick the winning raffle entries. Another highlight was the Wheel of Fortune game for children. The wheel had 7 wedges that spelled out KRISHNA and depending on where the spin landed, the children were asked 3 trivia questions about Sri Krishna with increasing order of difficulty. Those who answered all three were given prizes like the Bhakta Meera book by Sri Swamiji, and soft toys. 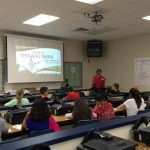 All participants also got to pick from an assortment of school supplies (pencils, pens, color pens, etc.) and candy! Also, all the little ones left with a fun activity sheet which included a crossword, quiz, maze puzzles, and a coloring activity. At least 100 kids took part and had fun while the parents were engaged in learning about our organization’s activities. Several GOD publications were displayed, and brochures highlighting GOD’s mission and Houston activities were given to all the visitors and passers-by. At least 200 people chanted the Mahamantra and many more received our pamphlets which were nicely packaged in plastic bags. Dry fruits prasad was also given to all. Dozens of devotees have shown interest in GOD’s Srimad Bhagavatam courses and Gopa Kuteeram classes. At the end of the long day, the Houston Satsang group left home physically exhausted but mentally recharged to continue spreading the glory of the Divine Name and our Sadguru’s mission.